If your child is slowly developing symptoms of "gearhead-itis," it’s a fair estimate to believe that you’re going to have to keep up with those incessant requests for toy cars and R/Cs, as well as the occasional complaints on why he’s riding in a minivan instead of a two-seat sports car. If you can live through all of that, and there’s no reason why you shouldn’t, you can give your child the biggest smile in the world by giving him Fisher Price’s Power Wheels Corvette Stingray. No, it’s not an actual sports car; what it is, though, is a tots version of the American sports coupe that has its own unique list of features. There’s a single racing seat, Power Lock brakes, and yes, a shiny set of fake chrome wheels to give your little one that all-too important neighborhood swag. The little electric Stingray runs on a 12-volt battery with top speeds announced at 6 mph. If you think that’s too fast, you can set it up so that it only reaches half that speed at 3 mph. 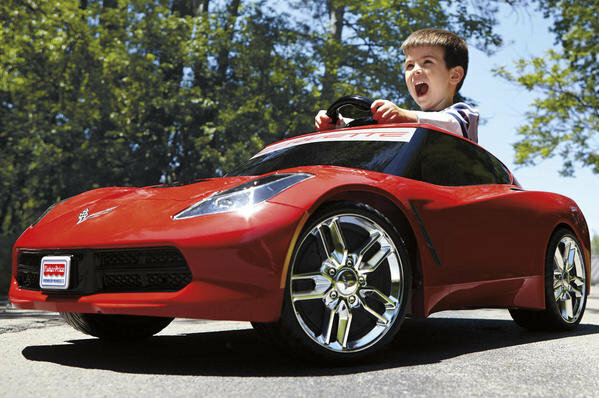 The Power Wheels Corvette Stingray will hit stores this coming September for $275, a relatively affordable price for the chance to see your kid have one of those mega-watt smile moments.